We announce our new logo and brand identity | iiaa Ltd | The UK and Ireland distributor of Environ Skincare, jane iredale makeup and Advanced Nutrition Programme. The Advanced Nutrition ProgrammeTM announced its brand and identity refresh at the Professional Beauty Show in February. Unveiling a crisp logo and innovative visual identity, the brand has clear strategies in place to build on its leadership position in the professional nutritional market. “The release of the new logo and visual identity marks a significant milestone in the journey that we innovated in 2006 to bring beauty from within to market" says David Alpert, our Managing Director. 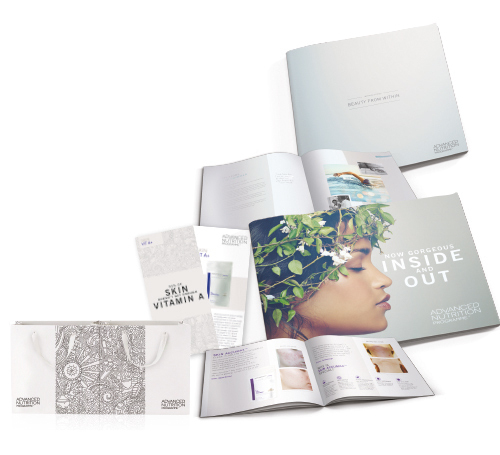 “It realises the potential for the Professional Beauty market and skincare experts to deliver a new level of skin health and well-being in addition to topical care. From the start, we set out to deliver something extraordinary. Our strategy was to differentiate ourselves with highest quality, natural ingredients, sourced from accredited, environmentally responsible sources and employ extensive live trials prior to any product release. The new brand identity will be rolled out from March. The new range of marketing and POS material for stockists will be communicated in a special Advanced Nutrition ProgrammeTM e.bulletin planned for w/c 20th March. Update your website with the new logo. Email customerservices@iiaa.eu to get the latest Dropbox link which will enable you to download it. Order your gorgeous new in-salon marketing material. Brochures, posters and product flyers will be available soon, find out more in your next Bulletin. Follow us on social media and share our posts with your own followers to raise awareness.